While I was browsing eMakers forum I can upon a post of somewhere to buy cheaper filament. I ordered some from Reprapkit.com at £49.90 for 2.3Kg. That price has now gone up – £62.37 – as they are out of pre-order – that said the listing is confusing stating they have stock but still on pre-order! Anyway back to the filament. 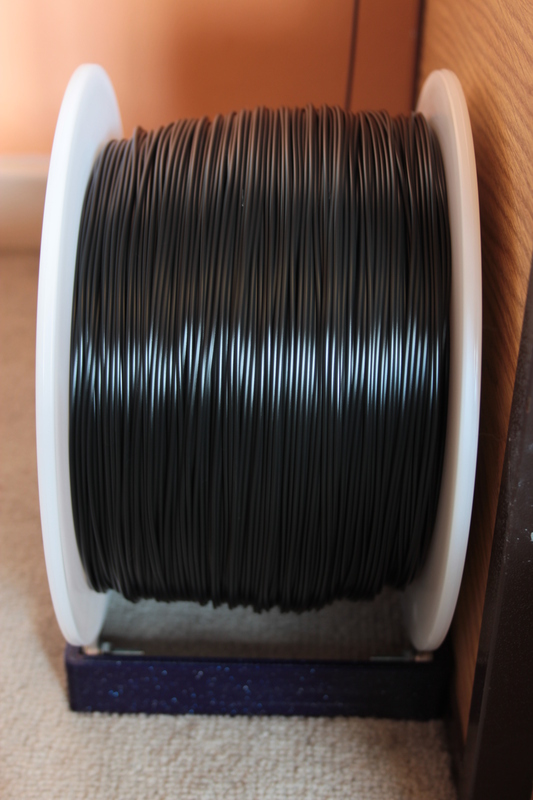 The filament is very good – it feeds well and the finish is shiny. There have been no problems with it stringing etc. However – as I have said – there are a negatives. The main one being that there seems to be a lot of moisture in the filament. This leads to some popping and spitting at lower print speeds – mainly on the first layer as it is printed slower. This leads onto any print that has a low feed speed – mainly those of a lower layer height – however I suppose you could simply increase the print speed. Considering this costs 6.5p per meter its faults so far are easy to put to one side. It sticks well, looks good and is cheap. It may have a little to much moisture for slower prints – which reduces its ability to work with thin layers – but its cheap making it great for test prints or prints requiring large amounts of plastic.